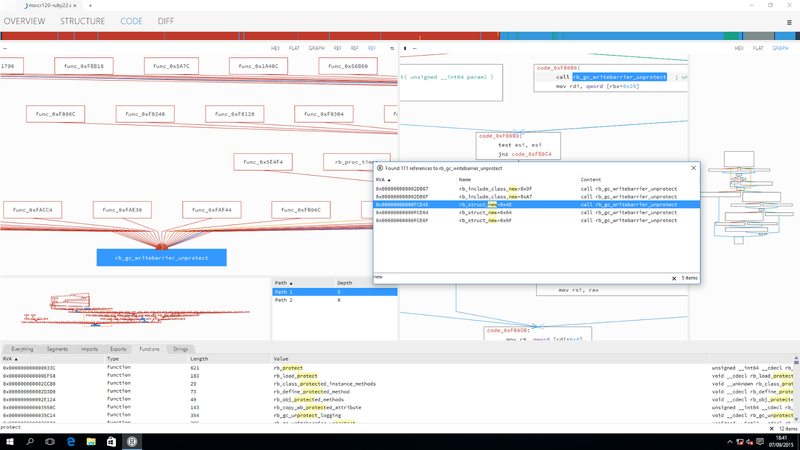 Relyze - Interactive Software Analysis: Relyze 1.3 now available! 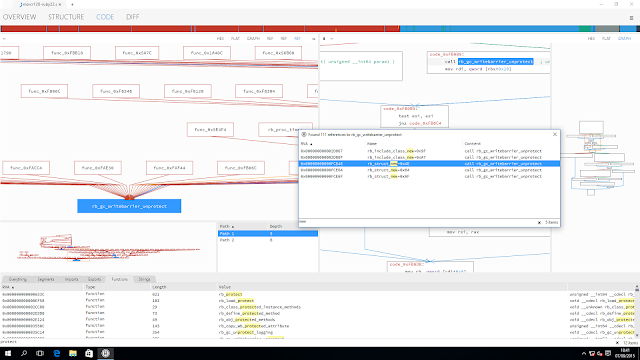 Relyze now shipped as either a 32 bit or 64 bit Windows application. Both builds are feature compatible. Reference graphs now use a separate pivot entry for each graph. You can close and move them via right clicking the pivot. Moved the reference graph overview into the reference graph for consistency with function graphs. Improve the reference dialog, now using a virtual list view for performance and can filter by text. Handle analysing PE files whose entry point is in a non executable section. Improve how the diff algorithm matches functions. Improve how the diff algorithm matches duplicate blocks from a switch statement. Bugfix, improve parsing scope table entry handlers in PE32+ exception directories. Bugfix, resolved several memory leaks. Bugfix, plugin editor control updated, resolving several issues. Bugfix, application crash during shut down under certain conditions. In addition we are now shipping Relyze as both a 64 bit and 32 bit Windows application, with a separate installer for each build. The 64 bit and 32 bit builds are feature compatible, but we recommend users install the 64 bit build. There is a small performance benefit to this as well as being able to access the larger 64 bit address space if you are analyzing or diffing very large binaries. To try Relyze for yourself, download the latest trial. Existing users can use the builtin update feature to receive the latest version. If you wish to move over to the 64 bit build from an existing 32 bit installation of Relyze you must manually download and run the installer.